If you’ve been following me on social media, than you know I’ve been crisscrossing the country this month! I’ve been in Florida, Washington DC, New York, Connecticut, Las Vegas, and California! A lot of my friends and family have been nice enough to let me stay with them on my travels which I always love because that means I also get to cook in their kitchens 🙂 While in NYC I stayed with my good friend Dori and I was able to make a bunch of food, which included these brussel sprouts. I realized I hadn’t shared the recipe with you guys yet! Of course, we ate them so quickly I forgot to take a picture of them! So here I am in Las Vegas and I made them again for my friends Eric and Cheryl last night. And I managed to grab a quick pic before they disappeared. This recipe is fantastic for Fall and perfect to serve to someone who isn’t the biggest brussel sprouts fan. 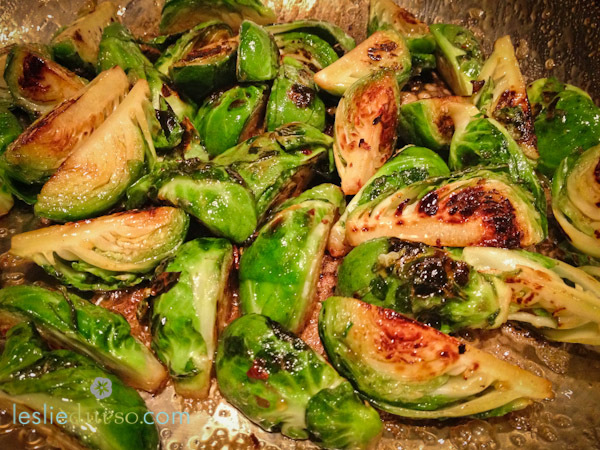 The maple caramelizes the the sprouts leaving them tender and full of yummy flavor! Heat a skillet on medium-high heat and add the olive oil. When it’s shiny (about a minute or so) add the brussel sprouts and salt. Toss them in the olive oil till coated and let sit a minute to brown. Continue to toss and sit until they are roasted and tender. That should take about 7 minutes. Add in the maple syrup and toss to coat. Let the maple syrup caramelize for about 5 minutes. Serve warm. **UPDATE I decided to kick these up a notch the other night and added a few chili flakes to them when you are sautéing and the spice was really nice with the sweet! Give it a try if you want to mix it up! i’ve never cooked brussel sprouts stovetop without shredding them first – can’t wait to try! So yummy! You’ll love these Lynn! Omg I love you! I’ve already made them once and about to make them again tonight. Special house guest coming…. Yay! I’m so glad you enjoy them Dori!! I made these tonight to go with our homemade chicken nuggets for dinner….YUM!!! They were so good I nearly devoured half of them before serving them to our family. My 4-year-olds even loved them. GREAT recipe Leslie! I’m going to make these more often! Finally made these tonight & they were a hit with 3/4 of the family (which is good cause normally brussel sprouts are only a hit with 1/2 of the family) 🙂 Thanks for a yummy family favorite!